All our coffee grinders have a beautiful design and a robust grinding mechanism. Although we offer a variety of these practical kitchen appliances, each with its own features, you can always choose how coarsely or finely you want your coffee ground – and how much to prepare. The smell of fresh coffee awakens the senses in the morning. All the more so if the coffee is made from freshly ground beans of your favourite type. The powerful coffee grinders in the WMF product range don't just look good. They also grind coffee beans precisely and reliably. We wish you a wonderful morning! If you're the nostalgic type, you probably prefer a good old, traditional coffee grinder with a handle that manually turns the conical grinder. Modern households that know the value of top-quality coffee are best served by an electric coffee grinder from WMF. A stable steel grinding mechanism mills a predetermined amount of coffee beans to the desired grade at the touch of a button. The results are a feast for the senses, and the incomparable aroma of coffee is soon wafting through your entire house. To ensure you can fully benefit from this wonderful smell, beans should always be ground freshly and used immediately. Our filter coffee machines turn them into the perfect delicious hot drink.  WMF grinders mill coffee or espresso beans as coarsely or finely as you want. The 12-level gradation gives you all the freedom you need. A conical grinding mechanism made of high-quality steel crushes the beans and transfers the resulting powder into an removable receptacle. You now have the basic ingredient for delicious coffee, which you can enjoy either neat out of our coffee cups, as a latte macchiato or as a milky coffee. To preserve the aroma of coffee beans, our grinders meet all the important criteria by which you can immediately recognise a good piece of machinery. In essence, two things are decisive: firstly, the grinder mustn't heat up the beans during milling because this destroys the aroma. And, secondly, delicious-tasting coffee requires the coffee particles to all be the same, uniform size. The more homogeneous the powder, the better the coffee. You can taste that our coffee grinders do an excellent job – cup after cup after cup. They also perfectly complement our filter coffee machines and espresso machines. Whichever you use, you'll never want to be without them again! Incidentally, if you ever have any leftover freshly ground coffee powder, you can store it perfectly in one of our aroma-preserving stainless steel airtight containers.